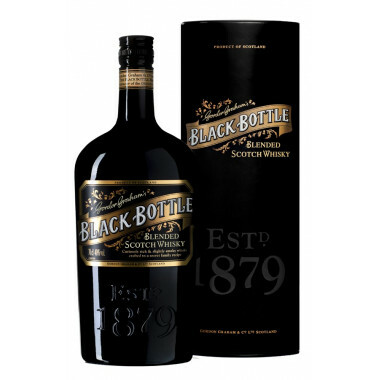 Black Bottle is firstly a luxury Blend with 45% malt. Black Bottle whisky is first of all a luxury Blend made with 45% malt. Its strength and subtlety rank it on the same class of many Single Malts. Black Bottle has a long story, beginning with the trials of Master Blender Gordon Graham. He was working night and day on its new creation. Happy with the results, Gordon Graham shared a dram with his brothers. They were astonished. The air filled up with a rich blend of aromas, fresh floral scents, woody, spicy and slightly smoky notes. The tasting was a success. Black Bottle was born. Its family recipe was a secret gem kept for more than 130 years. For the new 2014 edition, Master Blender Ian MacMillan gathered inspiration from the Graham family. The very subtle peat mingles with a rich overall. Its distinctive, rich and slightly smoky taste sensation develops, with a powerful finale. Gordon Graham’s Black Bottle or the taste of the unexpected. The Graham’s family had acquired a good reputation for their tea blends but did not wish to rest on their laurels. As Scots, nothing was more glorious than producing whisky. In 1879, Master Blender Gordon Graham works days and nights on his creation and then, served a drink to his brothers. They are astonished with the results. They discover a wonderful array of aromas from light floral scents to deep woody and peated notes. The Graham Brothers know that they found the taste of their future. Nose: fresh, floral and spicy with aromas of freshly sawn wood. Slightly smoky. Palate: mellow and strongly fruity, with subtle flavours of smoke balanced by tender wood and heather honey.